The Fotona QX MAXX laser machine offers the most advanced laser technology available, with maximum performance for removing a large range of tattoo inks, pigmented lesions and a wide variety of aesthetic services. The QX MAXX laser machine’s unique single-pulse laser technology has proven itself more effective at complete tattoo removal then many of the multi-pulse lasers on the market. Thanks to this powerful single-pulse Q-switched technology, you get larger spot treatment areas and more effective removal of deeply ingrained color pigments. The powerful QX MAXX utilizes an optimized wavelength selection in order to target the widest range of pigments. The system includes four treatment wavelengths in one to remove dark pigments, remove lighter pigments and vascular lesions and to get rid of deeply embedded greens, blues and purple inks as well. By offering the best combination of powerful wavelengths, the QX MAXX by Fotona is the ideal choice for treating a variety of skin lesions and removing completely detailed, deeply colored tattoos. The QX MAXX also supports Fotona’s premier Accelera technology, offering powerful treatment for laser hair removal, acne treatments and other common aesthetic treatments. 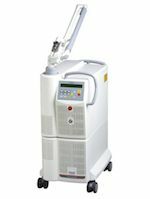 Interested in adding the Fotona QX MAXX laser system to your tattoo removal practice? SunrayLaser.com has great deals on usedFotona QX MAXX laser equipment with savings that are up to 60% off the original price! See for yourself how much you can save on high quality used laser equipment when you buy from SunrayLaser.com. Looking for pricing information and other details about our selection of pre-owned Fotona QX MAXX equipment? Please fill out the form below and we’ll provide a fast and free, no obligation quote. It’s an easy and no-risk way to learn more about this outstanding line of tattoo removal lasers.